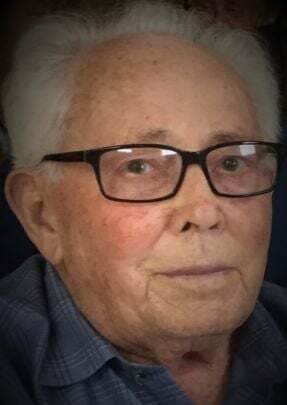 Raleigh Shepherd, age 86, of Jackson, KY passed away on April 2,2019. -He was born on May 27, 1932 to the late Woodrow and Myrtle (Bradley) Shepherd. -He was a retired mechanic from the Division of Forestry and Falcon Coal Company.-He served in the Korean Conflict and was stationed in Germany.-Raleigh was a loving husband, father, grandfather, great-grandfather and friend.-He enjoyed having coffee with his friends at Hardees and playing rummy.-In his earlier years, he enjoyed squirrel hunting, fishing, square dancing, traveling, and most of all playing his banjo.-He is survived by his loving wife of 67 years, Faye Shepherd.-He is also survived by 5 children.-Greg Shepherd and wife Sharon of Campton, KY; Sheila Mullins and husband Jim of Jackson, KY; Pam Noble and husband Charles of Lost Creek, KY, Rita Burnat and husband, Larry of Pinehurst NC. and Ray Shepherd and wife Carol of Lost Creek, KY. He is survived by 7 grandchildren, Beth Helton, Jessica Ritchie, Kenzie Noble, Kendra Noble, Chris Combs ,Shawn Combs, Charles Noble, JR.-He is also survived by 11 great-grandchildren, Josie Kate Ritchie, Lara Helton, Luke Helton, Skylin Combs, Peyton Miller, Parker Miller, Aaron Goins, Wes Noble , Addison Wright, Carter Noble, and Colton Noble.-He is also survived by 2 brothers:Don Shepherd of Jacksonville, FL and Lawrence Shepherd of Paris, KY.-Besides his parents, he was preceded in death by one “special” grandson, Bryan Shepherd; One sister, Leolla Howard and 4 brothers: Sonny Shepherd, Freddie Shepherd, Garlen Shepherd and Dan Shepherd.-Visitation for Raleigh will be at Deaton Funeral Home Chapel on Thursday, April 4th, beginning at 5 pm.-Services will be Friday, April 5, 2019 at 11:00 a.m. with military rights observed.-Burial will be at the Jackson Cemetery.-Deaton Funeral Home in charge of arrangements.-Pallbearers: Family and Friends.-Honorary Pallbearers: Coffee Drinking Buddies at Hardees.